Step frequencies 6.25 / 12.5 / 25khz, CTCSS, DTMF, 1000 channels, 16 zones, Tier2, TDMA (2 TimeSlot), Mototrbo compatible. The antenna connection on the mobile is SO-239 (female UHF). The TYT MD-9600 is available in 3 versions, be aware: Dual-band, VHF single-band or UHF single-band. At Passion Radio we only offer the dual band version (VHF+UHF). Supplied complete with: 1 TYT MD-9600 (V3) Dualband VHF-UHF DMR & FM, 1 microphone, 1 bracket mounting bracket, 1 DC power cable, screws and fuse, manual in English + USB TYT programming cable included. GPS in option to choose below. 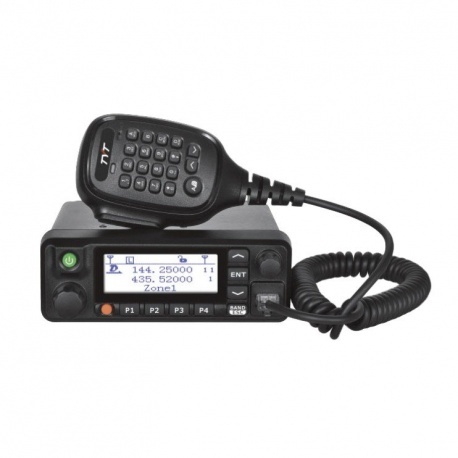 Description: New mobile TYT MD-9600 new version V3 is a FM analog and digital DMR and dual band , covers VHF band from 136 to 174 Mhz with 50 watts and UHF from 400 to 480Mhz with 45 watts , and now available with GPS Step frequencies 6.25 / 12.5 / 25khz, CTCSS, DTMF, 1000 channels, 16 zones, Tier2 , TDMA (2 TimeSlot), Mototrbo compatible. The antenna connection on the mobile is SO-239 (female UHF). The TYT MD-9600 is available in 3 versions, be aware: Dual-band, VHF single-band or UHF single-band. At Passion Radio we only offer the dual band version (VHF+UHF) . Supplied complete with: 1 TYT MD-9600 (V3) Dualband VHF-UHF DMR & FM, 1 microphone, 1 bracket mounting bracket, 1 DC power cable, screws and fuse, manual in English + USB TYT programming cable included . GPS in option to choose below.